This post series is a little different than my normal posts, but I think I'm going to like it and you will too. 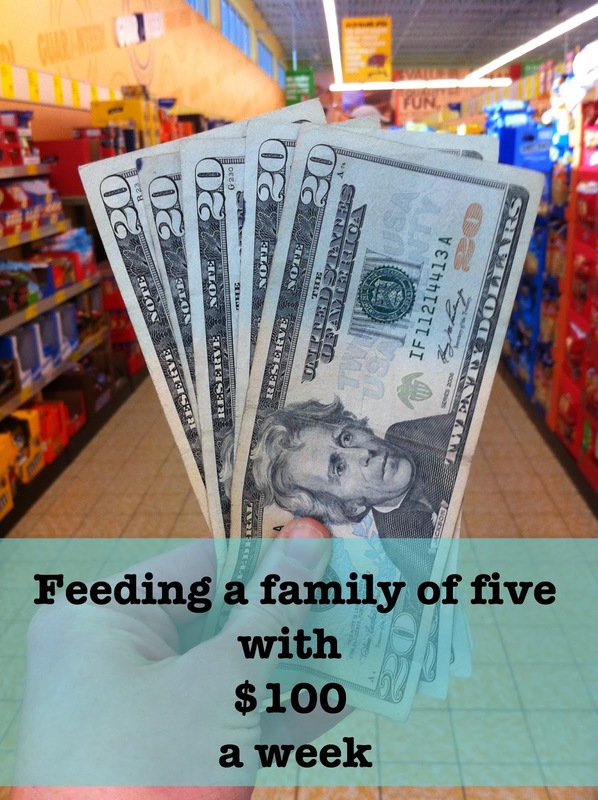 It's a five part series about how I am feeding my family of five with just $100 a week. Yep, $400 a month is feeding us! How to eat healthy, natural foods without spending a lot. We are not doing this because we need to. So why? My husband, who NEVER grocery shops, had some sticker shock when I told him how much money I was spending on groceries. (which I thought wasn't much). You see, many years ago, when we decided I was going to stay home and raise our children we had to set some budgets. It was just part of adjusting to one income instead of two. When we set the budgets it was just the two of us eating. We had an infant. Since then we have had two more kids and all 3 of them eat. ALOT! So, naturally I had "raised" our budget (in my head). Not to mention the costs of everything have raised significantly in the past 7 years. My husband thought we were still spending $300 a month on groceries! "Ha! That's impossible!" I said and his reply was "There's no reason we should not be able to feed this family with $100 a week." It includes diapers, toiletries, cleaning products, first aid and over-the-counter medications, toilet paper, paper towels, and anything else we would purchase at a grocery store. Before I start the weekly posts I just want to say somethings about us and how we eat that I think a lot of you may be wondering. We are healthy eaters, trying to eat as much organic and all natural unprocessed foods as we reasonably can. Two of my kids take their lunches to school (I pack them every morning). I have one kid in diapers. I make most of our cleaning products including dishwasher detergent and our laundry soap. Even though I save a lot of money this way, I still have to purchase the ingredients. We do not purchase much meat. We try to stay far away from mass produced meat. Occasionally we buy boneless, skinless chicken breast, bacon or all natural lunch meat. We eat mostly venison and farm raised chickens. We are attempting a "survival stockpile". Occasionally I buy things for the stockpile that we do not necessarily need right now. My youngest child is a bottomless pit and I buy "easy" foods specifically for her. That is most of the processed foods you will see. (crackers, pretzels, cereal, that kind of thing). And last, I will mention, I am not starting with an empty pantry. I am sure most middle class families have full pantries, cabinets and refrigerators. But, I did start when we felt we "REALLY needed to go to the store". Our "challenge" began February 1st and has surprisingly gone smoothly. I thought it was going to be really tough and we would be running out of things constantly, but we haven't. That being said, I really hope you will follow me on my journey of Feeding a Family of Five with $100 a week. You can click "follow by email" in the top right to receive updates when there's a new post. Otherwise, check back soon. Feel free to ask questions in the comments section below. I will do my best to answer them.